Cloud-based – no need to install software, players can instantly start training. Analysis – Post game and overall analysis & reporting of aiming performance. Accuracy, speed and under/over shoot tendencies. Comparison to previous games and overall player population. More to come! Training Plans – Offer players a set of games to help progress through different aiming skill types at increasing difficulties. Feedback and Training Suggestions – Data driven suggestions for which training simulations players should try next. Training Information – Blog posts analyzing data to provide aiming best practices and unique insights. At the time the idea was conceived the only existing aim training software was in a 2D environment and offered no other features. We knew we could do better. With the rapid rise of eSports it was clear that players needed resources to help them become the best they could be. We wanted to be the place aspiring eSports athletes came to improve their abilities. We first conceived the idea towards the end of 2016 and the beta site launched in early 2018. Since then we have been fixing bugs, adding new features based on feedback from the forums and analysing player performance to make sure they are improving. We are two friends who met at university while studying computer science many years ago. Since then one is a serial entrepreneur and the other works in data analysis for large .com businesses. More importantly, we are (and certainly were) avid gamers when time allows. Online at Aiming.pro! Cloud-based software, no installation required. Start training immediately. Aiming.pro is very much a data-driven resource. Offering players personalised analysis and feedback is a core feature. A secondary benefit is the aggregation of data across all players to find general tendencies. Check out the blog for some aiming insights. Aiming.pro is still in its infancy but we have already received tremendous feedback from our users. 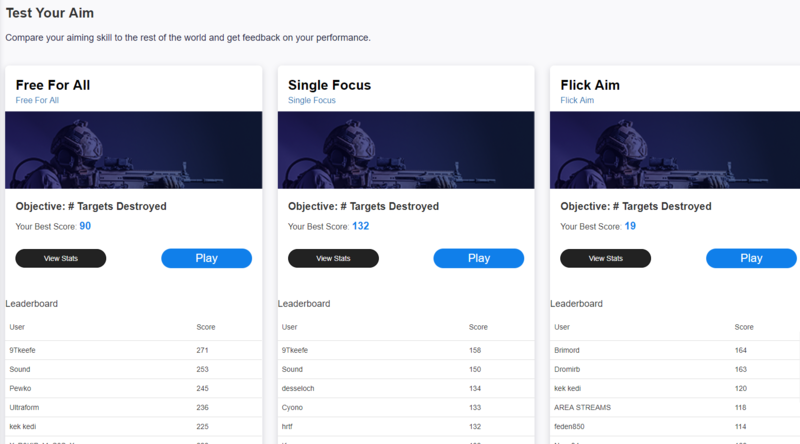 We can see first-hand how our site truly helps people improve their aim and we are rapidly rolling out new features and improvements to the site. We are really excited about what the future has in store. Please drop us a line in the forums or at [email protected].